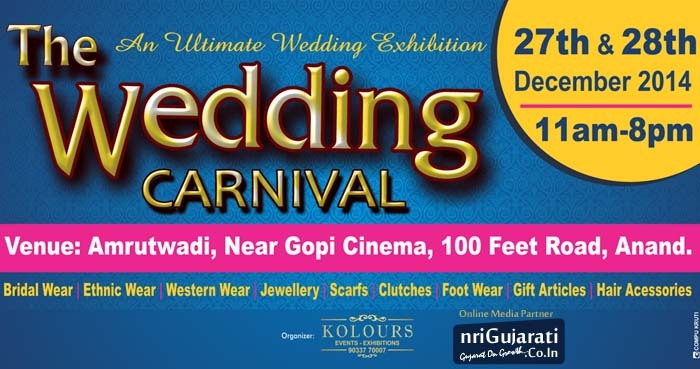 The Wedding Carnival in Anand at Amrutwadi, this exhibition an ultimate wedding Exhibition organizer by Kolours Events and Exhibition. Wedding Exhibition highlights Bridal Wear, Ethnic Wear, Western Wear, Jewellery, Scarts, Clutches, Foot wear, Gift Articles, Hair Acessories etc. The Wedding Exhibition so many new jewelry or bridal wear collections are available for visitor. So don’t miss this exhibition new variety available for visitor.